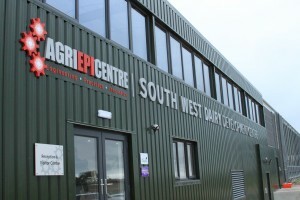 Kingshay and Agri-EPI have today, 2nd October 2018 launched its state-of-the-art South West Dairy Development Centre in Somerset, which aims to offer a fresh vision for sustainable UK milk production. 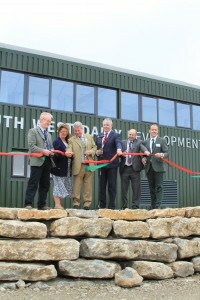 The new centre aims to tackle this by using emerging technology such as hyperspectral imaging and satellite data to monitor and predict grass growth in its surrounding paddocks, allowing the herd access to up to three fresh areas of grazing per day. A network of tracks and flexible paddocks encourage cow flow between the between the paddocks and the robotic milkers. The dairy is one of only a handful in the UK to uses GEA Monobox robotic milkers, which gather data about each cow’s milk yield and quality while optimising udder health. An automated ‘feed kitchen’ allows accurate amounts of fresh feed to be delivered up to 15 times per day. The automated rail mounted feed dispenser is positioned high up within the building, reducing disruption to the cows. The building is designed to protect the feed itself from wildlife and the weather. 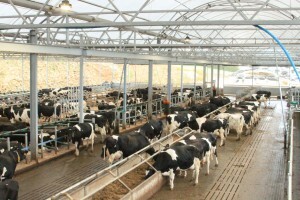 The cattle housing design reflects the best of the natural cow environment while providing automated protection from changing weather conditions. It includes enrichment elements such as rotary brushes and state-of-the-art lighting. The building itself is the first of its kind in the UK. Its lightweight fabric roof means the steel structure is also lightweight, making it faster and easier to install while reducing the environmental impact of its construction. The translucent fabric roof is black outside, helping to reduce its visual impact in the landscape, and white inside, providing even levels of light across the interior. The roof design achieves efficient cross ventilation to regulate ambient temperature. The design also allows for a more open plan interior, so the herd can see the robotic milkers from anywhere in the building. A number of trials are already underway or planned for the centre. It is one of three UK ‘testbeds’ for the 5G RuralFirst project, the UK's most ambitious connectivity project. Led by Cisco and involving a consortium of partners it aims to demonstrate how connectivity will benefit rural communities and business across the UK. A number of technologies utilising 5G data are to be trialled, including cow collars, monitoring health and welfare, digital systems to monitor cow fertility through milk analysis and, in the future, a 'virtual vet' system connecting stockpeople to a vet using augmented reality.